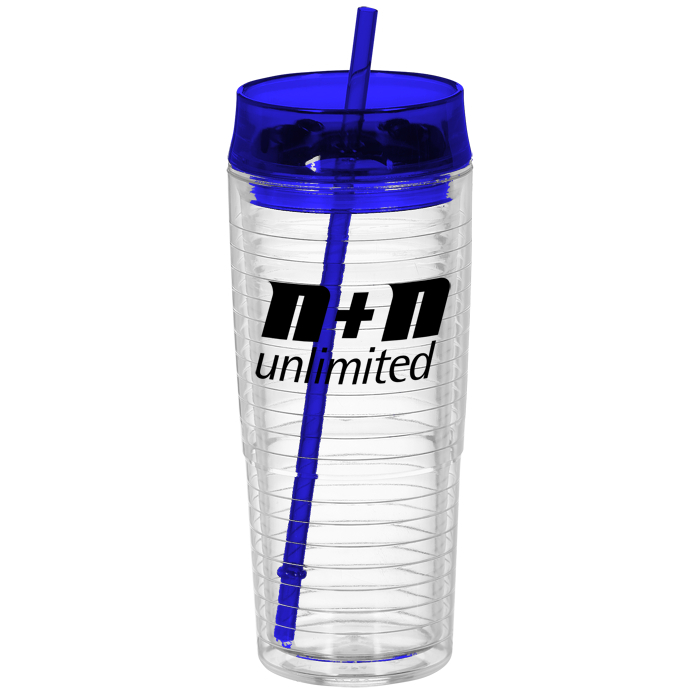 This custom tumbler is a speedy advertiser – 24HR! 2 color(s) to choose from! Click one of the color choices from the list. Once you're done, scroll down to select the item quantity. Enter the quantity you'd like, or click and drag our orange 'i' to find a quantity and price that's best for you. Price will be displayed once added to cart. Where should we place your design?Where on the item should we print your design? Check the box or boxes next to the imprint location(s) you would like, then click on the color tiles to select the color(s) closest to your imprint color. Once you're done, click the Add To Cart button to continue. What imprint color(s) would you like? Some like it hot and some like it cold. This double-wall tumbler features a unique lid that allows you to have it both ways! The gasketed push-on lid is designed with both a straw insert and a thumb-slide closure for your various needs. Hot or cold, the dual wall insulation system helps keep beverage temperature steady. Rippling inner wall design provides a fabulous visual draw. This BPA-free tumbler is made from #7 plastic, which can only be recycled in a few limited areas; check locally for more information. Your price includes a one-color imprint on the front of the tumbler. Special 24-hour service applies to production time only—please allow additional time for your choice of delivery options. Orders must be received by 6 PM, CT, and artwork approved by 7 PM, CT, Monday-Friday (not including holidays). A $40 service charge for rush processing will be added. Imported, logo applied in USA. Ready to ship in : 1 business days *. * Excludes art preparation time, applies only to orders of 144 items or fewer. Once you've completed checking out, an option is provided to upload your art file(s). We gladly accept all file types. Don't have your files right now? No worries, the confirmation email you'll receive after ordering will have additional instructions. Check out our art tips for more information. Visit 4imprint.com or call toll free 1-877-446-7746 to order or for questions. The has been added to your cart to show the sale price. Sometimes our vendors require us to advertise their products at a suggested price which means when we sell them for less, we only display that price in the cart. Beginning of dialog window. This dialog talks about 4imprint's 360 degree guarantee including our free samples, lowest prices, guaranteed satisfaction and on-time shipping. Escape will close this dialog window. You're covered from every angle. It's on time or it's on us. If your event is missed because we didn't ship on time, your order is free. If you find within 30 days of purchase that your order would've cost less elsewhere, let us know and we'll refund double the difference. If you're not 100% satisfied with your order, we'll pay to pick it up and rerun it or refund your money—your choice.